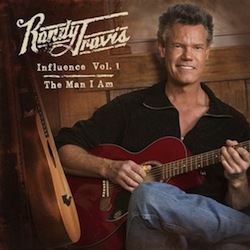 Randy Travis’ 21st studio album, Influence Vol. 1: The Man I Am, is set to hit stores on Oct. 1. The record is a journey back through Travis’ musical career to the songs and artists who influenced his sound and style, and features Travis putting his own vocal stamp on vintage songs from Merle Haggard, Lefty Frizzell, and Waylon Jennings, among others. It also includes his recent duet with Joe Nichols, “Tonight I’m Playing Possum,” the tribute to George Jones he debuted earlier this year at the CMA Music Festival. Travis first came upon the idea of making the album after releasing his 25th Anniversary Celebration and going back through his collaborations with artists like Zac Brown Band, Kenny Chesney, Willie Nelson, and Carrie Underwood, reflecting on the heroes who have inspired him throughout the course of his career. “When I think of my musical heroes of yesteryear, or the younger stars of this year, I am reminded that it is true we learn from the ones ahead of us, and teach the ones that follow. They are the reason I chose to make this album,” says Travis.